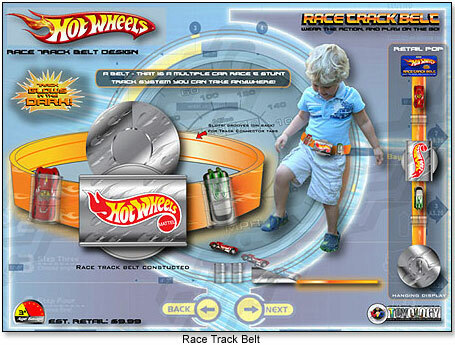 I once pitched an idea for a wearable racetrack to a toy company. I thought it would be a great fit. It wasn’t. Turns out the product wasn’t themed correctly and the cost was too high. Luckily, I was able to talk with the manufacturer and redesign and simplify the product, and then execute a viable idea for the company that would fit. I reduced the number of pieces that were needed to make it work and simplified the design. I also themed it to a property that worked with the concept “Cars” to help with the playability. In the end, it worked out, and we are exploring a licensing agreement. As an inventor, it is good to be humble and receive feedback, because well-established companies know what they’re talking about. 1. Ask and Research. Ask many questions of the toy companies you approach: What are you looking for, or what do you need? At what price? Where will it be sold, and what challenges do you have? This basically takes the guesswork out of it and helps form a good relationship with the toy company. You can determine estimated costs if you have been designing toys for years, or if you have a good understanding of today’s manufacturing and materials. This simply requires looking at any toy package to become familiar with the options, or researching materials on the Web to determine the rough cost as well as what kinds of toys call for certain plastics. For example, you might check IDES or GlobalSpec. 1) The Company or person may not, or cause others, individual or company, to disclose the nature of this concept to anyone else. 2) The Company shall not produce or cause to be produced any product the same as or similar to the "Concepts" until written agreement has been entered into — unless item is known to the public, or in public domain. 3) Any idea, sketch, drawing, model or other work produced, and all rights to such works, shall be the property of the inventor. 2. Discuss and Recommend. Again, ask companies what they are looking for, what categories, what price points, and what has worked for them in the past. How can you help them make their product better and more fun for kids? That way, they will feel that you understand their needs and constraints. If you have been inventing for a while, and have good relationships with toy companies, and have the working knowledge of how they work, send them ideas that you feel would be a good fit for them. Explain why, and take it to the next steps to help them develop it. I have submitted random ideas as well as ideas for toys that fit a toy manufacturer’s particular branding. For example, I have designed a few car-related items that were a good fit for Mattel’s Hot Wheels brand. If there is interest, and the idea needs to be prototyped in order for the company to see and understand how it works, that is the next step. Sometimes, though, an idea thought out, rendered, and explained is sufficient enough. First, I always pitch the idea, as a rendering, and usually only design what I know I can make. I do it this way because designers can get caught up in the prototype. You can generate a lot more if you work on the ideas, and IF there is interest, then start on the prototype. You don’t have to spend a lot of money. I usually spend about $100 on a single prototype, utilizing Home Depot, parts of other toys, paint and some tools. 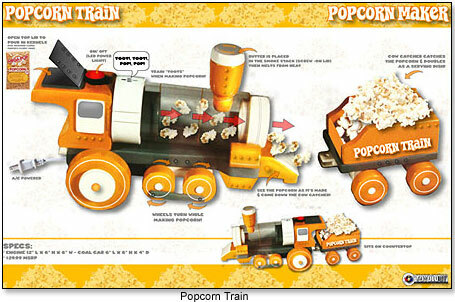 One of my flops was a kid popcorn maker that looked like a train. It flopped because it could cause potential harm to kids — electricity, heat and toys don’t mix — but it looked really cool making popcorn! I’m now looking into a battery-operated (safe) version. One thing I’ve learned is humility, and that you have to be able to take rejection and smile in its face. What I could of done differently is more research and planning before designing, as well as finding the best companies to market the idea to. Looking back, I determined the possible companies based on what they made. I liked certain toys, and knew people at these companies. However, given the economy today, everyone is hungry, so there are no set categories or toy companies you have to go to. Each one is open to new ideas. With my design company KID Toyology, I first designed for manufacturers I used to work for, then invented toys and submitted them to Hasbro, Mattel, Spin Master, Fisher-Price, MGA Entertainment, Jakks Pacific, Wild Planet and others. About that last one: Retail distribution is a war that’s going on behind the scenes. Each company fights for shelf space to display its best products, but the retail store also has ideas or plans for that space. The balance lies between the price of the product at retail, the cost of manufacturing, and the relationship of the toy company with the retailer. In the end, the winner is what will make the most money at the lowest cost that will be good for the consumer. It is much easier for a big toy company that has been established for years and has a good relationship with the retailer, as well as low manufacturing costs, to gain prime placement. A smaller company has to take more risks, and meet out of pocket expenses to compete. However, the smaller guy — if the toy is a big hit — will profit more, and will be more recognizable to the retailer the next time around. Retail limitations can be an obstacle but also an asset. When you design, be informed and careful of manufacturing costs. It is usually up to the toy company to get good retail space and relationships with retailers. Some successes I’ve had were the Water-Do! 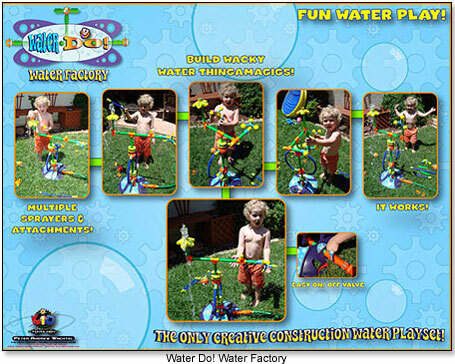 Water Factory, which is a water construction set for kids, and Snip n’ Stikz, which is an “All in one Scissor and Tape Combo” — no more losing the tape and scissors when wrapping gifts. They both should be in stores and on HSN this summer, under a private label. The reason for the success was the price point, the timing of the market and the look and need for the consumer. And, of course, the work, effort and passion behind the ideas. •TDmonthly Goes Inside: Toy Castle, Jonesboro, Ark. •How to Prove You're Really "Green"